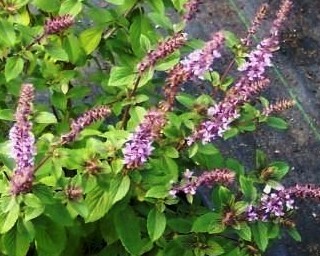 African Blue Basil - Beautiful culinary basil variety is at home in the flower garden or the herb garden. This variety features dark purple stems and veining on green leaves and tall purple flower spikes when in bloom. Camphor basil scent and flavor. Perennial zones 11+ Cannot be shipped to cold climates during winter months. Live starter plant in 3 inch container.